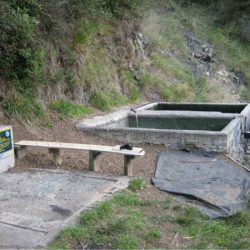 Map showing location of Tarawera Hot Springs [CLOSED] . Use the controls on the map to zoom in and out. Dropped passed to see these old historic pools. DOC have cut the baths up now so that they will not hold water at all. A shame to see that these pools have been abandoned. Would be a great project to see them rebuilt. Things are not good for access now. The second half of the track is very overgrown. DoC has padlocked the far access gate, but some enterprising person has cut a hole in the gate where you can squeeze through. However. beyond the gate the path is near impassable. There have been two major washouts and great care has to be taken to avoid tumbling into the river. This may be why DoC had padlocked the gate. Risking life and limb and hanging on to trees we managed to get across the washouts and on to the pools. All was as I remembered and had a very pleasant and uninterrupted soak. In view of the very hazardous path conditions now, I would urge that folks do not attempt to get to the pools. DoC is unlikely to repair the path, which will only get worse. Only the near pool was full, but was clear and pleasant. I enjoyed a long soak in the delicious hot water, taking in the view. Awesome! In view of the above this may have been my last visit. These pools may be closed BUT if you don't put your head under the water they are safe. They CAN get a bit green and slimy however I drive out from Napier once a week to bathe in them, listen to the native birds, and gaze out over the river. For me it is a time of peaceful contemplation, and release of stress. These pools are so relaxing out in the middle of the bush you can hear the river flowing down below. definetly woth a stop if your passing through. What a shame that it's been closed!!! I have been trying to find it's location ever since I heard about this amazing event. 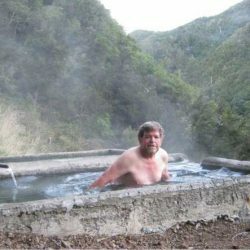 About 5 years ago I met an Maori man in Waipukurau when we were doing a computer course together. We were talking about our belief in Angels. He told me that about 15 years before he had stopped at the local pub there one day. His, then, 3 year old son wanted to go to the toilet, so dad had stopped and decided to have a bite to eat while they were there. He told me that while he was up at the bar, he meet a old Maori man he asked him why his son couldn't walk. He told him that his son had a crippling condition, and that he had never been able to walk and that Doctor's said he would be confined to a wheelchair for the rest of his life. 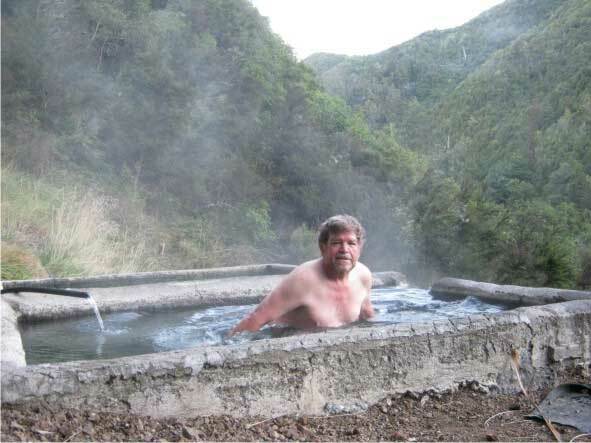 The old man suggested that he take the young boy down to the hot pool. When the boy got out of the pool he had gained movement in his legs, which increased over the next month and eventually resulting in the boy walking normally. As he still did as an 18 year old young man. The father had driven back to the pub to tell the man and to thank him, but something really strange happened because when he spoke to the Tavern owner and his wife. They said that they had never seen anyone who fitted the description of this old Maori man but that other people had also told them similar stories. So wish is that another miracle happens and the pools get reopened. 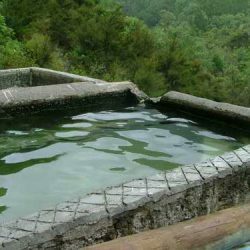 old abandoned hot pools on side of cliff. overgrown track, closed by DOC, has two slips to cross, 20 minute walk, lots of blackberry thorn bushes. not for young children or "tourists". pool has natural slim. that can be emptied, cleaned with a old brush, and refilled. which what i did 26jan15. 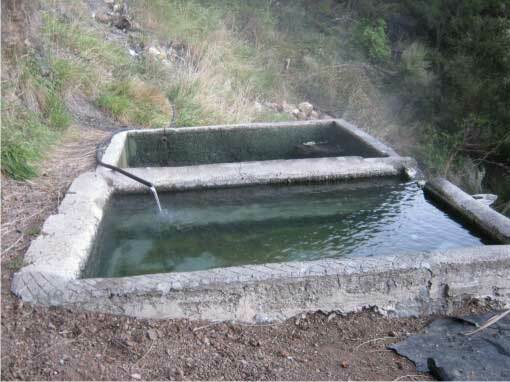 I also cleaned the spring in the cliff, cleaned the pipe, and refilled pool. if pipe is blocked, pull it apart in the middle to clear, then rejoin. "who do i send the bill to?" note the 4WD track from the tea rooms car park is now very rough at start and not for cars. if you go to the pools, do your bit of cleaning the place up please. 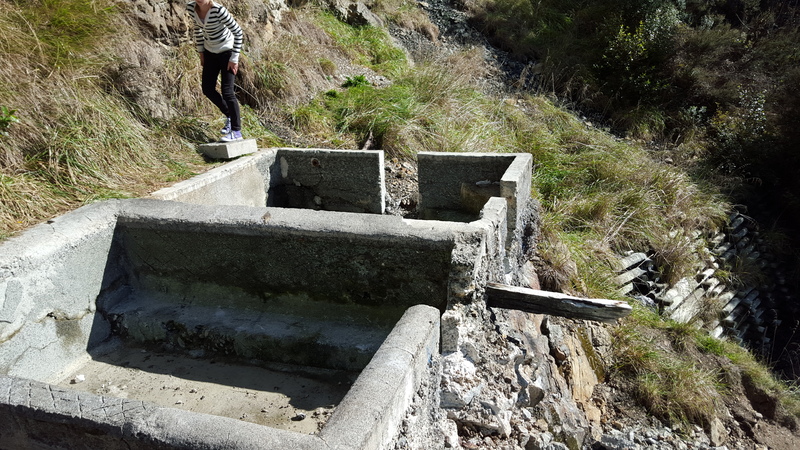 24/Nov/2014 Anyone Please repair the concrete bathtub. Hot water level is 40cm now. The tub cracked. You require many bate or wide sheet to repair. Hot water has been supplied even now. The closer, deeper pool was very slimy when we visitied mid winter 2013. Would need a clean and a refill with the hose. Hose was still running hot water from the nearby hot spring. Hose was in the shallower, clean tub next to the deep one. 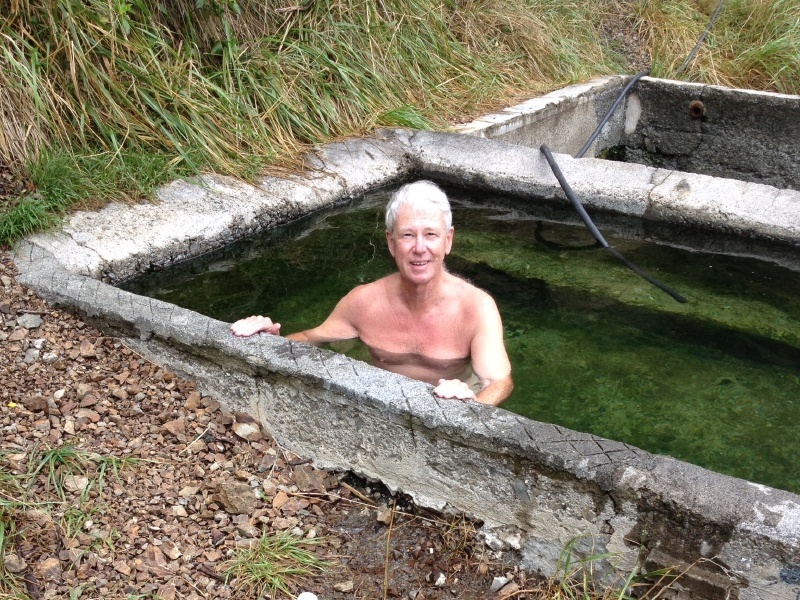 Didn't want to mess with the process, and the warmer of the two pools would have only been about 37 degrees. BUT! I will be back, as this is my friend's favourite pool in NZ, so it MUST be good sometimes. Rustic, but well worth it. They're not developed, otherwise they would have tour buses etc lined up at the gate. 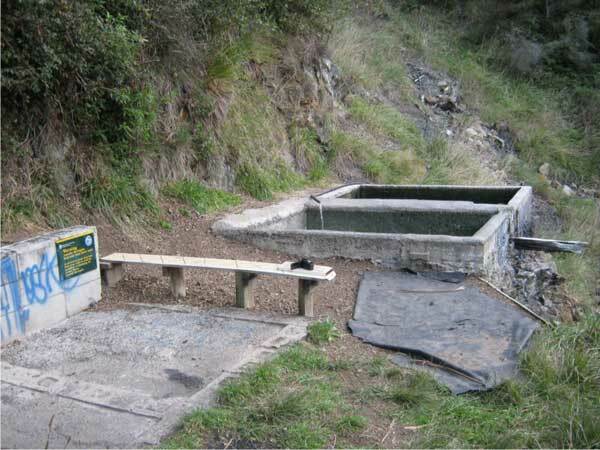 June 2011 - the baths have been closed by DOC. You use at your own risk. Signs warn of amoebic meningitis. Above description (slimy) still applies, but real nice on a cool, grey day overlooking the river. Amazingly peaceful! I would recommend taking a bucket and rope to haul up water from the river though cause it is freaking hot! Plus take plenty of drinking water as you will need it! Always wondered why the Tavern has that name, stopped off there last week and found out! Wonderful place. 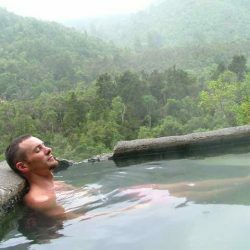 When I was there it was during a spectacular thunder storm, great to sit in the tub with the cold rain on my shoulders and the lightening flashing in the clouds. If you want clean and man made go to Waikite, if you want naked (optional), natural, basic and free then this is for you. 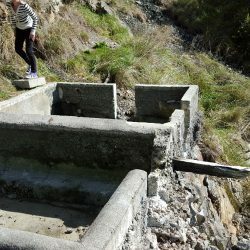 DOC I'm sure you have better things to do, let the locals care for their historic pools for ever! 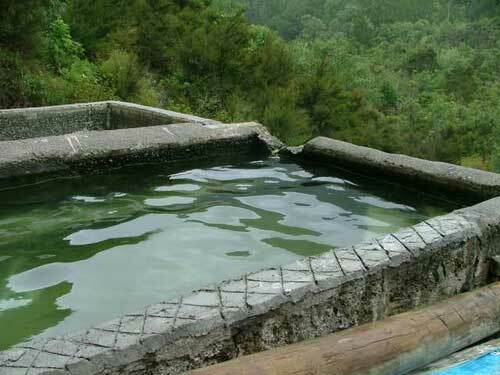 There are two concrete pools which you fill with the aid of an pvc pipe from a small waterfall. pools are in a bad state,rough concrete and leaf litter, but surroundings are great. a quick clean then enjoy. What a wonderful relaxing place with a amazing feeling being on the side of the hill. 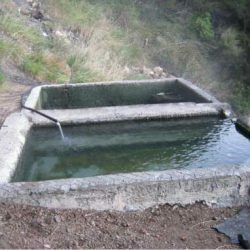 The locals maintain this and have been bathing here for centuries. Just stop into the Tavern and the new owners Jim and Maree will give you directions. (They have excellent coffee and free camping and campervan parking in their grounds too now). 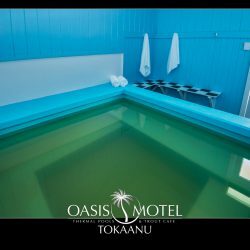 I recommend you take a few minutes to study some of the amazing history of this area and the pools which is displayed on the walls of the tavern/cafe. This is the first I have heard about the healing but it does not surprise me. Please visit and log your support on this site. Thanks Ngaire for making these pools available, they are brilliant. We felt priviliged to use them. 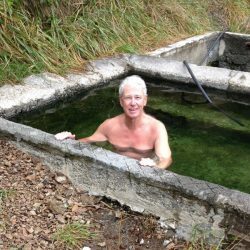 In fact, it IS an amazing place thanks to the river right below where you can cool down and then return back to the warm water. And no people at all- it is officially closed! Certainly off the beaten track, but thorougly enjoyable. Source: Taken in 2016 about a month before DOC trashed the tubs. We had a real struggle to get to the tubs but it was well worth it. Glad that I had that last opportunity. Source: Pools having been cut up. thanks a lot DOC.